The original Breedlove ukelele, designed and perfected by Kim Breedlove, with impeccable fretwork and precise geometry in stunning myrtlewood and bearclaw Sitka spruce. Inspired by Kim Breedlove's passion for the sea, the KB Signature Ukulele features a beautiful seahorse inlay, pearl side dots on the fretboard, stunning abalone rosette and top purfling, koa peghead overlay and a koa and ebony overlay on the bridge. Satisfy the call of the sea with the Kim Breedlove Signature Uke. The Breedlove ukulele collection is driven by Kim Breedlove’s personal passion. His long-standing infatuation with ukuleles is born from his connection to Hawaii – every year, he spends several weeks in the middle of the Pacific in the lush island landscapes, overlooking powerful pristine seas. Kim toiled for years over early Breedlove prototypes to engineer the perfect uke sound. 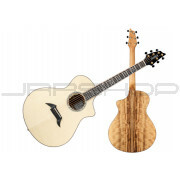 Originally, Breedlove ukes were available only by custom order, but by 2010, Kim had perfected the distinctively crafted sound in his signature model, and Breedlove released the Kim Breedlove Signature Ukulele as the first production uke. 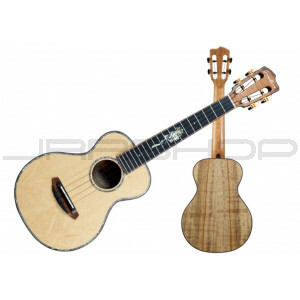 The Breedlove ukulele sound – the crystal-clear brilliance and lively “chunk” – is a result of the ultra-lightweight design, five-fan bracing, and minimal hand-applied finish. All Breedlove ukuleles are meticulously handcrafted in Bend, Oregon out of the most exquisite woods, for an experience that will whisk you away to the islands, if only in your imagination. Bearclaw Sitka spruce, picea sitchensis, originates in the Pacific Northwest region of the United States. It has a shallow, cross-grain curl that seems to increase cross-grain stiffness. 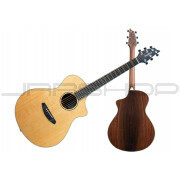 Many luthiers feel that the curl enhances the tone and sustain of Sitka spruce. While the cause of the figure is unknown, it is widely assumed to be a result of either genetic mutation or climactic stress. The tone profile is a strong, focused tone with solid fundamental, which makes it perfect for flatpicking styles. 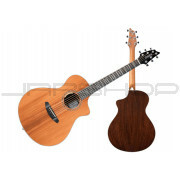 Bearclaw Sitka spruce usually takes a slightly longer period of playing time to open up. It is widely appreciated for its unique patterns, which result in an eye-catching shimmer in a finished instrument.